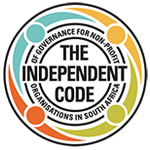 Soraya Joonas, Finance Director at Inyathelo: The South African Institute for Advancement writes on the 5 elements that will contribute to ensuring a healthy and robust financial management system for your non-profit organisation. Budgeting represents the future strategic plans of your organisation, translated into financial numbers to ensure success and viability. Ensure when budgeting that you are completely honest with what a programme or project is going to truly cost. The direct costs associated with a project do not make allowance for the indirect cost associated with housing the project within your organisation. Often administrative costs needed to support the project are underestimated. In addition to budgeting a percentage proportion for each direct staff member (including a smaller percentage for your receptionist, bookkeeper and web designer as they play an indirect role), include a portion of overheads so that each programme ‘pays its ways’. Overhead cost line items to include are rental, utilities, office insurance, stationery and equipment rental. You can also include a contribution to budget line items for marketing, dissemination of learning, staff development and strategic planning. You will also want the programme to contribute to the cost of auditing and any legal fees. Normally donor budgets are quite rigid with little flexibility on what can be spent on line items. However, by adding a 10% administration fee on the cost of a project, this gives you some leeway to spend funds on items related to administering the programme that you may have shortfalls for during the year. As this can generally be undesignated within an ‘administration’ line item, if you find that you are able to source additional funding during the year, this is a way to reinvest your savings into reserves. In tandem with budgeting realistically, adequate forecasting is paramount to future security. Plan for what the organisation will need in 3-5 years from now so that you are aware of where the gaps are and what amounts need to be requested in a proposal. Include a capital budget. If capital expenses do not make up a significant part of your operations, a capital component can be embedded in your overall organisational budget instead having a separate capital budget. Systems and policies are not created in a day, but building these up gradually over time will help your organisation make appropriate decisions in the most efficient and effective way. It will help you from straying during moments of time constraints and it will help ensure transparency and fairness in line with the organisation’s values. The likelihood of employee compliance will be increased because they will have a defined process to refer to. Essential to this is establishing a routine payment process and policies around service provider contracting and authorisations. A paper trail should be kept of all transactions and it is important to adhere to timely payments. As a part of internal control, having a slick filing system for record keeping is helpful when managing finances. It enables you to access information quickly, remember assumptions and decisions made about budgets and meet legal requirements effectively. An external audit will run much more smoothly and donor confidence is gained when controls are tight. In addition, for solid internal control, it is important that no single person perform all accounting functions. A process needs to be in place to monitor performance against the budget on a monthly basis. A budget which is never opened is of no use and will not ensure that an organisation’s operations are going according to plan. If things aren’t going as expected, share this with the team and agree on the changes that need to be made to realign. Some non-profit organisations set up their Chart of Accounts (budget model) according to programmes and others according to donor contract budgets. Creating a budget model is an organic process. As the non-profit sector is dynamic and circumstances change, additions, adjustments and improvements can be made to the living budget document throughout the year. This could happen quarterly or bi-annually depending on your organisation. We all know that reporting to donors on time with accuracy and transparency is paramount. However, internal reporting to management is crucial to decision making and should be done monthly. Although the finance manager is the administrator of funds, the programme managers ‘own’ their direct programme budget line items. This means that the programme manager is the person who is responsible for spending down these funds and therefore needs up to date information on how these budgets are performing. Relevant and readable reports should be submitted to managers monthly and meetings should take place on a regular basis to discuss variances. Your Finance Manager should prepare reports for your Board. As custodians responsible for the financial health of the organisation they will want Financial management reports. 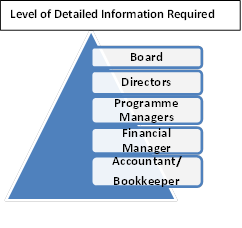 The level of information needed will be different from a programme manager’s needs. Reporting must be concise and clear. Graphs, charts and ratio analysis can be used where possible to convey simple messages. A cashflow forecast is meaningful to an organisation to ensure that there is enough cash in the bank to cover expenses throughout the year. As income is not always fully aligned with expenses during the year, a cashflow budget will assist in highlighting certain periods so that these tighter instances can be planned for. It also gives an organisation insight into useful information to consider when negotiating contractual terms with a donor i.e. timing of funds received. You will find that auditors are increasingly asking for these cashflow statements when assessing whether or not an organisation is a going concern. It is also important to assess the liquidity in your organisation and what amount of this is attributed to unrestricted funding. Ideally, an organisational benchmark is to be able to hold at least 3 months in operating expenses to cater for unforeseen circumstances should they arise. If this is being monitored closely, (and ideally over longer periods of time i.e.2-3 years), there should be no reason for a funding crisis. Gaps should at least be known well in advance, so that the fundraising arm of your organisation can strategize around this well in advance. • The British Columbia Museum Association. www.museumsassn.bc.ca. Best Practices Module-Financial management. Hall and Duckles. 2005. • A New View of Non-profit Financial Management. 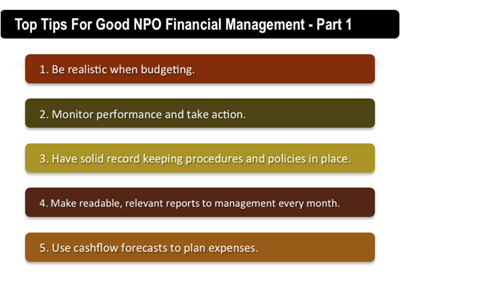 2007 Survey of Nonprofit Fiscal Operations and Guide to Best Practices. Fiscal Management Associates, LLC. July 15, 2008. • Financial management of not-for-profit organisations. CPA Australia Ltd. November 2009. • Building Stronger Nonprofits Through Better Financial Management. Early Efforts in 26 Youth-Serving Organizations. Kotloff and Burd. April 2012. Author: Soraya Joonas, Finance Director at Inyathelo – the South African Institute for Advancement. 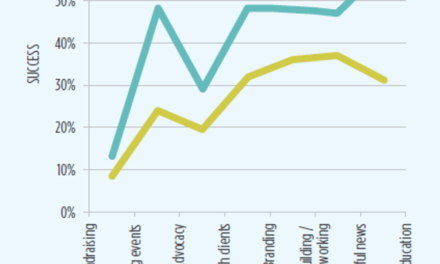 How does having a budget impact on the results of social media work?